While the handwritten words work pretty darn well because Silhouette cuts so beautifully, occasionally you may want to cut them smaller or on something more paper-like where it will require them to be thicker. Did you know you can thicken ’em up yourself? Please note: If you are working with the DXF file like I am here, turn your image into a compound path first by selecting all parts of the word, right clicking and selecting Make Compound Path. Great tip. What font is that? I love you handwriting!! How did you transfer it to the Cameo? Thank you!! I knew to use the offset, and I’ve done that a lot, but I always did the offset and then removed the “inside” shape. This is just THAT much easier!! cha ching- I have been wanting to know forever- how to thicken letters! The fonts are so pretty but when I go to cut them they are too thin! thanks a bunch! Thankfully, I did know that and it’s because I learned it from YOU or from taking one of your Silhouette classes! Very excited for the new class and I’m already signed up and raly to learn some more wonderful tips/hints!! You work that machine like you designed it!! Amazing!! Thanks for sharing your wisdom with all of us! THANK YOU! 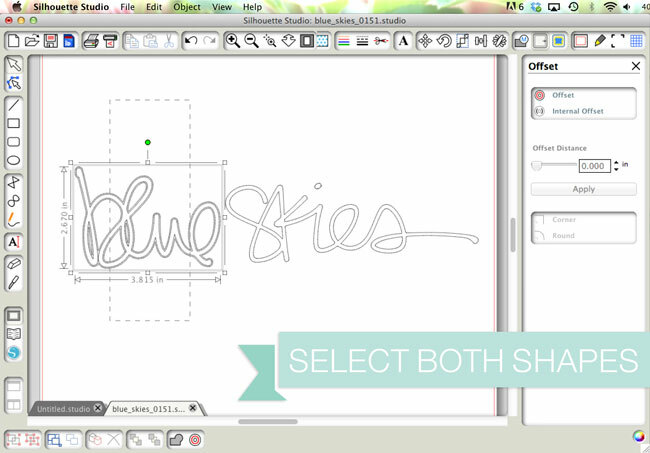 OMG – I am a fairly new Silhouette user – this info is so helpful! You just saved me hours of fussing — and I am very appreciative. You are so amazing. Thank you for the tip Kerri. Thank you! I was doing it with more steps than this – perfect! Many thanks for this tutorial! very useful!! Thank you for this information. I just bought the Silhouette Cameo with expectations to cut fabric appliques using my machine embroidery patterns. I started with one that has block numbers. 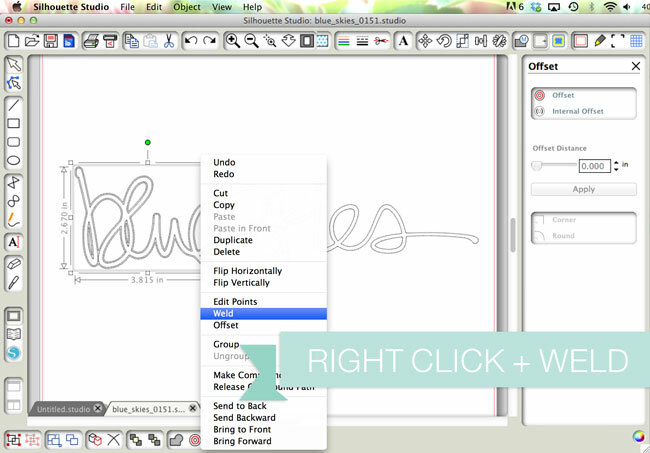 The designs I use provide a ‘tack down stitch’ which can be used to create a .jpg outline the Cameo can open. But the applique needs to be slightly larger than the tack down stitch, otherwise the machine stitching won’t hold it in place. I followed tutorials specifically for using the Cameo for this purpose and they all talked about resizing to add anywhere from 1-2mm. None of these tutorials mentioned the offset function. The resizing doesn’t work for this purpose because it stretches the design which doesn’t always move the outline in an outward direction. I googled Silhouette Cameo Resize Issues, and saw your information on thickening. The offset design thickens the outline moving all lines an equal distance out, and that is exactly what I needed. Great information and very much appreciated. Génial ! Merci kerri ! That is exactly why I bought the Cameo. Embrilliance update (July 2014) added the ability to save the cut line of an appliqué as a Studio file (or SVG). I haven’t tried it yet, but this might save having to do the offset. Besides it’s a great embroidery app for the MAC! I would just colour the letters in and use the print and cut feature instead of trying to cut all of those letters and then gluing them onto something!! Don’t forget to set all of the line colours to nothing.